Cut off the stems of the sprouts and trim any discoloured leaves. Place into a steamer and cook on high heat for 5 minutes. Remove and allow to cool. Heat a heavy skillet over a medium heat for 2 minutes. Add butter and melt so as to coat the skillet. Add the shallots and sauté for 2 minutes. 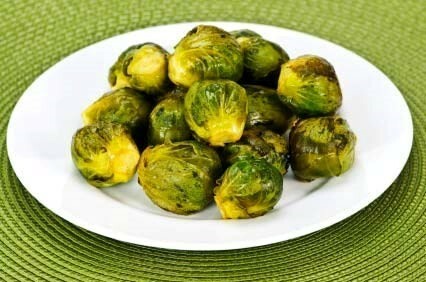 Then add sprouts, salt and 3 tablespoons of water – spread everything evenly across the pan. Reduce the heat to medium/low, cover and cook for 4 minutes. Meanwhile combine mustard, brown sugar and remaining water in a small bowel: stir until blended. Once sprouts have cooked for the 4 minutes, pour the mustard mixture over them and stir. Reduce heat to low, cover and allow the mustard mixture to infuse. Do not overcook – keep checking with a fork to make sure the sprouts are still firm. Finally turn the heat back to medium and allow the sprouts to really caramelise up and turn a deep golden brown colour with fully developed intensity of flavour. Serve warm with a sprinkling of black pepper.